Money isn’t everything but everything needs money. With a lot of aspiration and hopes, we have entered in 2017. You must be looking for good Money Mantras to elevate your financial life. 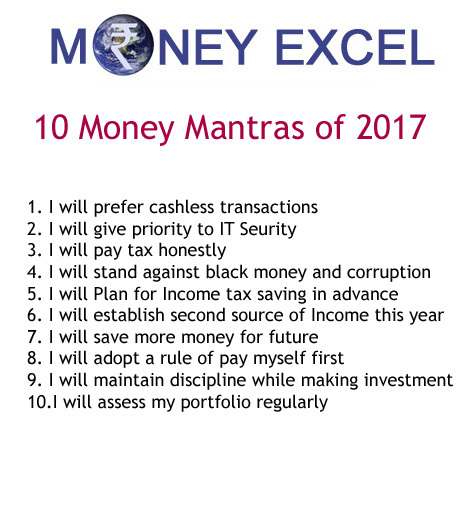 I am here with 10 Money Mantras for 2017. I am sure that these money mantras will defiantly improve your financial life in 2017. The first money mantra for 2017 is adopting cashless transactions. You should adopt a cashless transaction in 2017. After demonetization, the country is moving towards a cashless economy. A cashless transaction gives benefits like transparency, cashback, discount and convenience. However, the biggest risk of the cashless transaction is a risk of identity theft. The second money mantra for 2017 is giving priority to Information security in order to prevent identity theft and fraud while doing cashless transactions. Follow proper information security method. Never share your PIN and ATM card number other bank account related confidential information with anyone. Earn honestly and pay tax honestly. The third money mantra of 2017 is about paying tax honestly. By paying tax honestly, you can avoid unnecessary harassment by income tax department. You can proudly live a peaceful life as an honest taxpayer. The next money mantra for 2017 is helping government against black money and corruption. Black money and corruption are the biggest enemies of our country. Removal of black money and corruption will defiantly help every citizen of India. Every year we rush at last minute to save tax and end up making bad investments. This year take a pledge that you will start income tax planning exercise in advance. Advance tax planning will surely help you in taking an informed decision. The next money mantra of 2017 never depends on the single source of income try to generate a second source of Income. Distributed income source always helps you to reduce a risk. Start with part time online or offline business to establish the second source of income. Money saves the money saver keeping this thought in mind the next mantra is saving more money for the future. You should challenge yourself by throttling your saving level. If you want to be rich adopt a rule to pay yourself first. This means before you spend any money on groceries, entertainment or household expense allocate an amount for yourself into your saving. The next money mantra for 2017 is maintaining a discipline while making an investment. The best way of maintaining discipline is SIP. You should atomize your investment via SIP route. The last money mantra for 2017 is regularly reviewing your investment portfolio and making changes as per requirement. 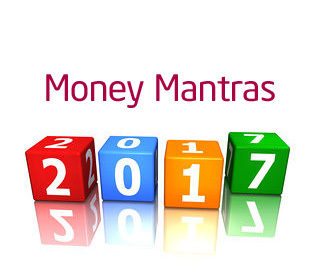 I hope money mantras mentioned above will help you in getting financial success in the year 2017. What are your money mantras for 2017? Do share in the comment section.